In today's lab, you will measure the rate of electron transport in thylakoid membranes isolated from spinach chloroplasts using a procedure called the Hill Reaction. This procedure will allow you to measure the rate of oxygen evolution, and thus the rate of photosynthesis, in the thylakoids of isolated spinach chloroplasts. Central to life on Earth is the photochemical process carried out by plants and cyanobacteria, wherein quanta of light are converted into chemical energy. In plants, light is absorbed by chlorophyll a and b and other antenna pigments of the light-harvesting complexes of Photosystems I and II. Chlorophyll a and b impart the green color that one associates with plant leaves. Carotenoids, which are yellow pigments, are also present in leaves but are usually masked by the chlorophylls. It is only in the fall when the chlorophylls are degraded faster than the carotenoids that the yellow color becomes visible to us. The chlorophyll and carotenoid contents of plants can vary markedly with its age, or depend on environmental factors such as light intensity or quality during growth. The pale green appearance of a willow tree in early spring is markedly different from its olive-green of late summer. The intense dark green of "shade adapted" plants differs from the lacy green colors one sees at the top of a forest canopy. Chlorophylls are found in the chloroplasts and are associated with the thylakoids, the internal membrane network of these organelles. It is now established that all chlorophylls are organized as discrete chlorophyll-protein complexes within the lipid matrix of the photosynthetic membrane. The majority of chlorophyll a molecules (and all chlorophyll b and carotenoid molecules) function as antenna pigments. In combination with proteins, they form the light-harvesting complexes, which absorb and funnel light energy to the reaction center chlorophylls, thereby allowing the plant to utilize a broad spectrum of wavelengths for photosynthesis. Some of the chlorophyll a molecules serve specialized functions in the reaction centers of photosystems I and II, where the light energy is used to drive the reduction of components of the electron transport chain. The energy from photons is passed via resonance energy transfer to a special pair of chlorophyll a molecules located in the reaction center, leading to the excitation and loss of electrons from these molecules. In each photosystem the excited electron from one reaction center chlorophyll is passed to the quinone primary electron acceptor thereby reducing it. The primary acceptor immediately donates its electrons to a neighboring molecule and so on through an electron transport chain to ultimately reduce NADP+ to NADPH. The resulting oxidized reaction center of photosystem II is able to split water molecules into protons, electrons and O2. The electrons extracted from water replace the electrons lost by the reaction center II chlorophyll. The reaction center chlorophyll of photosystem I is reduced by electrons coming from photosystem II. This electron transport is coupled in two steps to the formation of ATP through the mechanism of chemiosmosis. First, during the light reactions, the transport of electrons is coupled to the movement of protons from the stroma to the thylakoid lumen, forming a pH gradient across the thylakoid membrane. The sources of these protons are the splitting of water, which occurs on the lumenal side of the thylakoid membrane, and the transport of protons from the stromal side across the membrane into the lumen by the electron transport chain components plastoquinone and cytochrome b/f complex. In the second step, this gradient of protons is released when the protons diffuse through the membrane-spanning ATP-synthase molecule, which couples proton movement to the synthesis of ATP from ADP and Pi. In today's lab, you will study the photosynthetic electron transport of thylakoid membranes isolated from spinach chloroplasts. During the isolation procedure, some of the more water-soluble components that function near the terminus of the main electron transport chain are lost. This makes it impossible to follow the production of ATP or the reduction of NADP+ in your preparations. As is routine in studies using mitochondria and chloroplasts, we will supply an artificial electron acceptor to monitor "partial reactions" of the electron transport. These are chemicals that accept electrons at positions of the electron transport chain where exogenous compounds normally do not act in vivo. Frequently these electron acceptors are dyes specifically selected so their reduction can be monitored by spectrophotometry. The dye reagent we are using in this experiment is 2,6-dichlorophenol indophenol (DCPIP). It is blue when oxidized and colorless when reduced. DCPIP accepts electrons between the electron chain components plastoquinone and cytochrome. The electrons are ultimately derived from water. In 1937 Robert Hill showed that this partial reaction of the electron transport chain using DCPIP could be used to investigate the rate of oxygen evolution (from the splitting of water molecules in PSII) and thus the rate of photosynthesis in thylakoids of isolated chloroplasts. The reaction is now known as the Hill reaction and is still used today to determine photosynthetic rates in chloroplast preparations. In this lab you will examine the light reactions of photosynthesis by measuring the so-called Hill reaction in lysed chloroplasts. You will practice these measurements until you get reproducible results. Next week you will investigate the effect of various environmental factors on the light reactions of photosynthesis. For the isolation of chloroplasts from spinach, a buffer is used since the leaves, when homogenized, can yield a low pH suspension. In the initial isolation step, the sorbitol serves to maintain an osmotic potential similar to that of an intact leaf. The divalent cation Mg2+, known to be important to membrane structure and function, is also included in the medium. All isolation and fractionation steps are performed at 4 degrees C to minimize proteolytic degradation of proteins. Be sure to keep all beakers and buffers on ice. Note that there are four different media used to prepare a thylakoid suspension: grinding medium (100 mM Tricine NaOH pH 7.8, 400 mM sorbitol, 5 mM MgCl2), breaking medium (20 mM Tricine NaOH pH 7.8, 5 mM MgCl2), resuspension medium (50 mM , 100 mM sorbitol, 5 mM MgCl2)and reaction solution (100 mM sorbitol, 5 mM MgCl2, 50 mM NaPO4, 0.05 mM DCPIP). Note the differences among them. Be sure to use the correct solution. Read labels carefully throughout the experiment. Work in groups of eight students in steps 1 through 9. Throughout the procedure, be sure to wash glassware with water and the round bottom centrifuge tubes that have come in contact with chlorophyll using 70% ethanol. Please do this as soon as you have finished using this equipment. Prior to lab, 60 g of spinach leaves were mechanically macerated by our lab specialists with 160 mL of grinding medium using Waring blenders. The ground up spinach will be given to you in a 500ml iced cold beaker. A group of 8 students will filter the spinach through 2 layers of cheese cloth into another iced cold 500 ml beaker. You must gently squeeze the spinach in the cheese cloth to express the liquid and leave the pulp and debris in the cheesecloth. Discard the cheesecloth with the pulp in the trash can. Filter the expressed liquid (containing your intact cholorophasts) through 8 layers of cheesecloth into another 500 ml cold beaker. Gently squeeze the cheesecloth to express the refiltered liquid, then discard the cheesecloth and pulp in the trash can. Clean Up: Rinse all empty beakers with water immediately BUT DO NOT DISCARD THE FILTERED EXTRACT to be used in the next step! To isolate chloroplasts, divide the filtered extract into 4 35 ml portions and pour them into four 50 mL plastic round-bottom, capless centrifuge tubes. Balance each pair of tubes by transferring extract from the heavier tube to the lighter one. Centrifuge at 1000 x G in the SS34 rotor (see the conversion chart next to the centrifuge to convert RPMs to RCF which is also called g) for 5min in a Sorval refrigerated (4ºC) centrifuge. After the spin, each pair of students continues with one tube containing a pelleted chloroplast-rich fraction. From now on you are working in pairs. #Carefully decant (pour off) the pale green supernatant into the sink. Save the green pellet (chloroplast-enriched fraction). Balance against another group, and centrifuge at 1900 x G for 5min. Discard the supernatant down the drain. Resuspend the resulting pellet containing your thylakoid-rich fraction in 1.5 mL of resuspension medium. This suspension is your stock preparation of thylakoids to be used in the Hill reaction. Keep it on ice. (Resuspension medium: 50 mM Tricine NaOH pH 7.8, 100 mM sorbitol, 5 mM MgCl2). Blanking the Spectrophotometer (Instructions are also found in Appendix B): Use a tube containing 50µL of your thylakoid suspension added to 5 mL of clear resuspension solution (NOT reaction solution!) to blank the Spec20 at 580 nm (filter level to the left). With Parafilm® over the top of the tube, invert once to mix, then wipe the tube with a Kimwipe® before blanking the instrument. Do not vortex. You may need to prepare a fresh blank periodically. By blanking the spectrophotometer you are "subtracting out" the green color of the thylakoids from your reactions. Make sure your instrument has been warming up for at least 30min before use. If not turn it on with On-Off Knob (A) and wait. Set the wavelength to 580nm using Wavelength Selector (D). Insure that the filter lever located at bottom front of instrument is in correct position (to the left for wavelengths 340-599nm). Use Zero-Adjust Knob (A) to set meter to 0%T. Be sure that your blank (thylakoids in resuspension solution) is loaded in a 13mm test tube, not a plastic cuvette. Wipe outside of test tube with a Kimwipe™, insert it into the Tube Holder (C), and close the lid. Use 100% Adjust Knob (B) to set meter to 100%T, which is equivalent to zero absorbance on the absorbance scale. Remove the blank tube and save it in your ice bucket. Measuring the Reaction Rate: The Hill reaction occurs at different rates depending on the light intensity and the quality and concentration of the thylakoids in your reaction. Our goal today is to determine the best light intensity and thylakoid concentration for a 90 sec. reaction. You will measure the reaction rates by taking absorbance readings over that time period in 15 s intervals. We will use the drop in absorbance over time as a measure of reduction of blue DCPIP to colorless DCPIPH. If we can control all the variables properly, this reduction rate should also be an indication of the rate of photosynthesis since the light and dark reactions are coupled. Depending on the number, distribution (clumped or not) and condition of thylakoids in your reaction tube, you may obtain varying reaction rates with a given light intensity. We measure the incident light using a light meter in units of µmol photons m-2 s-1. Typically, the light intensity is set at ~80 µmol photons m-2 s-1 in order to drive the reaction at the desired rate — a drop in absorbance per 15 s that is consistent throughout a 90 s trial. However, that intensity may not be appropriate for all thylakoid preparations at all concentrations so you will have to experiment with both the light intensity and the concentration of your thylakoid suspension to find a rate that does not use up all of our substrate (DCPIP) too quickly (before 90 sec.) 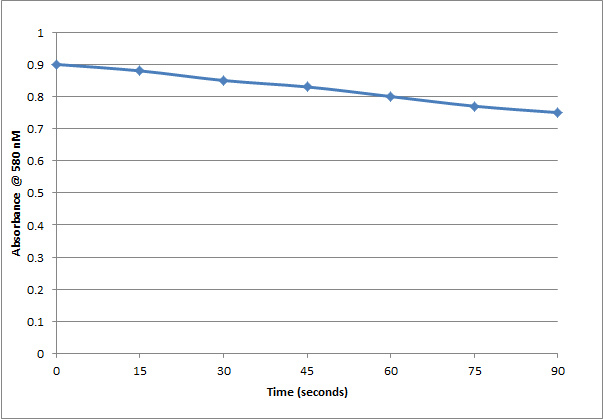 or that is too slow to approach substrate depletion in two minutes. The 15 s reading intervals consists of 10 s of thylakoid illumination and 5 s to read the absorbance in the spectrophotometer. Your goal is to establish conditions favorable for a 90 s experiment. This data collection at interval of 15 s should yield 7 data points (i.e., absorbance readings at time = 0, 15, 30, 45, 60, 75, and 90 s) that are all in the linear portion of a curve when you graph absorbance (y axis) vs. time (x axis). If your light intensity is too high and/or your thylakoids too concentrated, your curve will flatten before the 90 second reading because you have depleted your DCPIP substrate and those data points after substrate is limiting will be unusable. If your light intensity is too low and/or your thylakoids too dilute or of poor quality, the data points obtained within an optimal 90 sec. reaction will not measure enough of the linear part of the reaction to give a reliable rate. Figure 4: A consistent drop in absorbance of DCPIP over time. Figure 5: A fast drop in absorbance of DCPIP over time. The last two data points represent a leveling off of the absorbance - meaning that all of the DCPIP has been converted to DCPIPH2 and no electron transport is occurring. Figure 6: A slow drop in absorbance of DCPIP over time. This reaction is so slow it would not come to completion in 2 minutes or less. Figure 7: An inconsistent drop in absorbance of DCPIP over time. The trendline does not fit the data as nicely as the good example and there is a leveling off at the end suggesting that the DCPIP has been used up. Measurement of Hill Reaction Rates: For each reaction tube, do the following in turn. Set your light intensity to give ~ 80 µmol photons m-2 s-1 illumination of a tube that is held steadily in the tube holder apparatus. Now you are ready to start your first trial reaction. Turn off the light while you make your initial “dark reading”. The thylakoid suspension will settle over time so gently swirl to resuspend. Add 50 µL of the undiluted stock thylakoid suspension to a reaction tube containing 5 mL of blue reaction mixture, mix gently by inverting once and place tube in the Spec20 to obtain a "dark reading" with the spectrophotometer set at 580 nm. This is the time = zero seconds absorbance reading. Now expose the thylakoids to the light and take absorbance readings every 15 s (10 s illumination + 5 s reading) for 90 s (7 readings). Record absorbance readings and times in your lab notebook. Take care not to shield the tube from the light with your hand. Plot the data in excel as described below. If the majority of your data points are within the linear portion of the curve repeat steps 2-6. 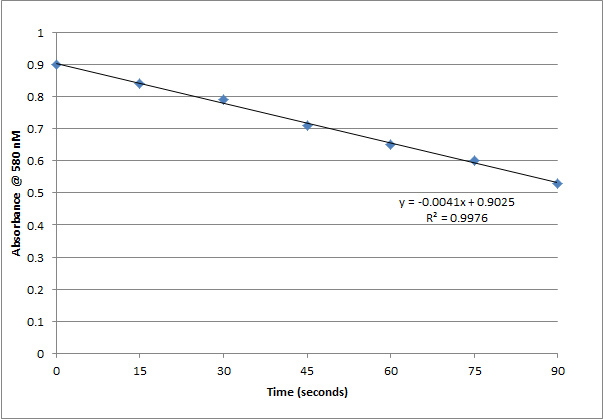 Your goal is to complete 3 runs that give approximately the same rate (slope of the line). If your rate is too slow then increase the light intensity. If your rate is too fast then decrease the light intensity or decrease the amount of thylakoids. To decrease the amount of thylakoids use 50 µL of a ½ dilution of the thylakoid suspension (use resuspension buffer for dilution) OR use 25 µl of thylakoids for both your blank and reaction. A description of simple linear regression and directions can also be found in Appendix E .
Assign a title to column A (the x-axis) of spreadsheet and enter time in seconds starting with zero. 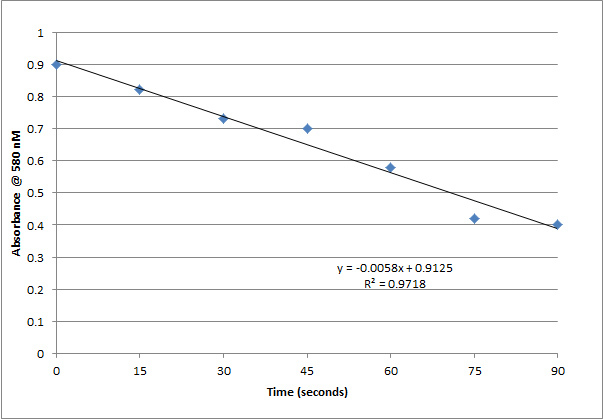 Assign a title to column B (the y-axis) and record the A580nm values that correspond to each time point. Click on the Charts tab below the toolbar. A gallery of chart types will appear below. Press the X Y (SCATTER) button on the far right to display the appropriate charts in the Elements Gallery. Make sure that you choose the display option where the data points are NOT connected with a line. Examine the data points for linearity. If the curve begins to flatten, substrate may be depleted and those data points should be removed from the data in the scatter plot BEFORE going to the next step. Click on a data point to highlight all points that are linear (make sure you have removed any that show evidence of limiting substrate). Under the Chart menu, select Add Trendline. The Format Trendline window will open. Press Type in the left column to select linear regression. Press Options in the left column to display the regression equation and the R-squared value on the chart. Repeat, starting with number 3, until you have a separate plot and trendline with equation and R-square value for each trial. Compare your trials to determine your optimal conditions for the experiment (light intensity and thylakoid concentration) and check your consistency (an R square value close to 1). You should do more trials at your detemined optimal conditions until your R square repeatedly approaches 1 and the starting zero time absorbance is fairly consistent between trials. When you have graphs that show this consistency, call your instructor over and show her/him how you determined which light intensity and thylakoid concentration is best and that you can do the experiment with adequate reproducibility. To make finish your best graph for your lab notebook, open the Formatting Palette by pressing on the Toolbox icon. Under Chart Options you can label the axes. 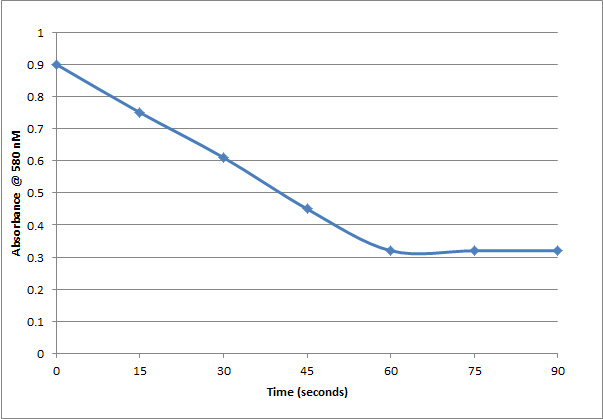 (Be sure to include appropriate units: time in seconds for the X axis and A 580nm for the Y axis -no units ). You can also show or hide the gridlines as you choose. Make sure the title differentiates which trial you are plotting since you want a separate graph for each trial to be able to compare them. To print your best graph for your notebook, from the File menu select Page Setup... Choose the Orientation of the printout (portrait or landscape). Adjust the Scaling to a figure other than 100%, if desired. A 50% scaling works well for inserting graphs into your lab notebook. The printer closest to L310 is called "Hallway HP4200" and is located outside the lab (L-310). Next week you will start with the light and thylakoid concentration conditions that you have determined are optimal when you perform a self-designed experiment that tests a variable that may affect the Hill reaction rate. Because you will have to make a new thylakoid preparation next week and because there are many variables that affect the quality of these preparations, the conditions that worked well this week may need to be tweaked next week. Our goal next week, like this week, is that we can make the reduction of DCPIP linear until DCPIP becomes limiting -- indicated by a leveling off of the absorption near the end of a 90sec reaction. With time in seconds plotted on the x-axis, the slope of the line (m value in the regression equation for your line y=mx+b) will reflect the change in absorbance per second. Change over time is rate; therefore, our reaction rate is the reproducible slope obtained under replicate trials at the same conditions. You will work with a partner and with another pair to obtain data at baseline and at conditions that test a variable that you hypothesize will show an increase or decrease from the baseline rate. Your instructor will post to your lab Sakai site a list of reference articles on variables affecting the Hill Reaction. In Lab 10, you and your partner(s) will isolate thylakoids from spinach using the same protocol as you used today. You will test the effects of one environmental parameter on the Hill reaction rates. Please sign up today with your group to test the effects of one of the following parameters: temperature, light intensity, inhibitors or uncouplers. Today you will work on a protocol as a group of 4, and in Lab 10 you will work as a team to complete the experiment using the protocol you have designed. A hypothesis with rationale and a plan for controlling confounding variables and/or acquiring an appropriate baseline for comparison. Proper controls for your experiment. Before you leave lab today, your instructor will either approve your proposal, or suggest improvements. Consider the normal growing conditions which spinach usually tolerates. How would varying the temperature between 0°C and 45°C affect the rate of photosystem II electron transport in its thylakoid membranes? Would the temperature itself affect the behavior of DCPIP, our artificial electron acceptor? In terms of the practical aspect of this experiment there are several things to think about: you will need to equilibrate each tube for a few minutes at each temperature in a water bath before adding the thylakoids; you will have to dry the test tube between readings; therefore, you may want to read the absorbance every 20s or 30s instead of every 15s. Consider how changes in the intensity of light will influence the electron transport rate in photosystem II. Would you expect a linear increase forever in electron transport rates with increasing light intensity? Why/why not? You can vary the light intensity by varying the setting of the intensity knob of your illuminator or by changing the distance between the light source and the thylakoids. Just make sure to uniformly illuminate your thylakoids and make sure that you are not also increasing the temperature of the thylakoids, a possible confounder. Inhibitors act either by binding to a component of the membrane or altering membrane structure by denaturation and/or solubilization. If electron transport is blocked, or the membrane is disrupted, there will be a decrease in electron transport and in the reduction of DCPIP. For inhibitors, the effect is concentration-dependent. For chemicals altering membrane structure, inhibition is usually time-dependent as well as concentration-dependent. Uncouplers act by "uncoupling" electron transport from its rate-limiting dependence on the photophosphorylation machinery. Uncouplers may have various mechanisms of action, but the end result is the dissipation of the proton gradient. We cannot measure the production of ATP, but we can measure electron transport using the dye, DCPIP. When the reactions relating to electron transport and the creation of an H+ gradient are uncoupled, electron transport proceeds at a faster rate. Therefore, the reduction and therefore color change of DCPIP occurs faster. You may test concentration as a variable by testing different dilutions of the stock solution of these compounds to find the concentration at which they no longer affect the Hill reaction. Remember that some compounds may act as uncouplers or inhibitors depending on their concentration. Inhibitors and uncouplers are usually added in 100µL aliquots to insure that the concentrations of all of the other ingredients in the reaction tubes are altered as little as possible. Calculate the effective concentrations of your inhibitor or uncoupler (the concentration while the reaction is occurring). Wash glassware with water and centrifuge tubes using 70% ethanol. Discard reaction mixtures in sink and test tubes in glassware disposal box. Glass pipettes should be left to soak in the pipette canisters, tips down. Place micropipette tips in the small orange bags at the bench. Pasteur pipettes and cover slips go in the glass container (blue cardboard box). Remove the last test tube from the sample chamber, and turn off your Spec20. Quit out of all applications on your computer. You and your partners have designed your protocol in lab. Please look at some additional papers focusing on your variable. Make sure that if you are diluting a reagent that you calculate the effective concentration of that reagent in your protocol. Ratios are not enough information. Please turn in one copy of your protocol with all partners names to your instructor for grading (5 pts). Before leaving lab today, take the Genetics Series Post-Assessment and email the passcode to your instructor to receive 2 participation points. This page was last edited on 21 November 2013, at 06:28.